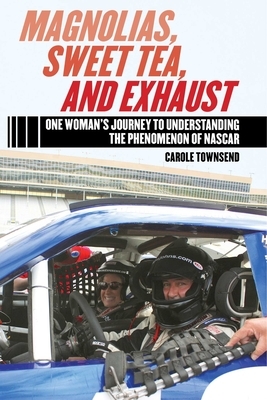 In Magnolias, Sweet Tea, and Exhaust, Carole Townsend goes to ground with NASCAR, following the races at Southern tracks from one to the next, learning about the sport and the culture of NASCAR as she goes. Townsend meets and interviews top drivers as well as some of NASCAR’s rising stars, legends, team owners, pit crews, and fans. In a display of immersion journalism at its best, Townsend takes a ride in one of the cars on a track at race speed, tours the multimillion dollar garages in North Carolina, learns from mechanics, mingles with fans, and participates in the much-coveted infield camping party at Atlanta Motor Speedway. Gaining behind-the-scenes access at races, she experiences up close the dedication, competition, and precision of NASCAR teams during qualifying trials and races. Some of the interviews and viewpoints included in the book are 2013 NASCAR Hall of Fame nominee Rex White (the 1960 NASCAR Grand National Champion), David Ragan (winner of the 2013 Talladega May race) and his pit crew chief Jay Guy, top contender Clint Bowyer, and driver Johanna Long, the 20-year-old Nationwide Series phenomenon. Team owner Michael Waltrip and 16-year-old rising star Mason Massey also talk with Townsend about the sport’s popularity, its changing face, and today’s challenges. Townsend also covers NASCAR and its good old boy” roots in bootlegging, as well as Southern food and hospitality as represented by that great traditiontailgating (a sport in itself). She also discusses the fascinating evolution of NASCAR racing rules and the growing popularity of NASCAR abroad. Carole Townsend is a reporter and columnist for the Gwinnett Daily Post newspaper in Georgia and has been published in Ladies’ Home Journal and other national publications. She has appeared on CNN and FOX, ABC and CBS news, and talk shows. When she started writing this book, Townsend began accepting invitations to be a guest on various NASCAR racing radio shows, including Doug Allan’s Spirit of Racing. As a journalist and strong advocate for the health and well-being of women and children, she also tours throughout the Southeast and speaks to various groups on the topics of becoming an author, making career changes, and living in the South.